A wicking bed is a revolutionary way of watering. It helps to save time and water, while producing lush, healthy, and unstressed veggies regardless of the heat of the season. But, not only the wicking bed has advantages, but also it has some disadvantages. Wicking beds are suitable where watering is infrequent, for example community gardens and school gardens because nobody is present over holiday periods to water the garden. The water reservoir in a wicking bed can carry enough water to keep the plants alive for up to several weeks depending on climate, season and location. Wicking beds are also useful for gardening under and around trees with invasive roots that extract every last bit of moisture from the soil, such as Australian eucalyptus trees. Growing plants in wicking bed systems is a useful technique that increases the range of possibilities of what gardener can grow where. Wicking beds can be placed close to the house without risking flooding your basement, since the water is contained in the bed. The wicking beds have their limitations just like any artificial gardening system. The following limitations of wicking beds. Most plants require a wet-dry cycle to grow, but wicking beds create an environment with constantly moist soil which is unsuitable for many plants. Water is retained in a wicking bed, this leads to a build up of fertiliser and the evaporation of water from the soil combined with the upward wicking carries the excess salts concertation to build up to the upper soil levels where shallow rooted seedlings are planted. 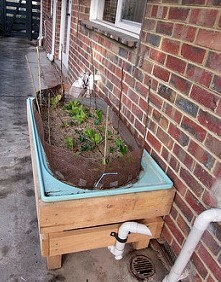 Another issue is that the lowest soil levels in wicking beds are always wet, while the upper levels can be fairly dry. As a consequence, the depth of the plant roots which dislike ‘wet feet’ (constantly waterlogged soil) will be very unhappy in a wicking bed, and will usually fail due to root rot. In addition to, it becomes a soggy, anaerobic (without air/oxygen) sludge that may promote root diseases. In many gardenings should be simple, cheap and sustainable. But, the problem of wicking garden for most people is cost. The need of large properly for wicking beds is expensive to build. The system of wicking beds is similiar to hydroponic systems. The plant in wicking beds is so short lived they don’t live long enough to develop long term problems due to the soil conditions, and require large amounts of nutrients in a short period. Wicking beds are best suited to grow annual vegetables. Now that we understand the advantages and disadvantages of a wicking bed system, let’s have a look at how they work. 0 Response to "The Advantages and Disadvantages of Growing in Wicking Beds"